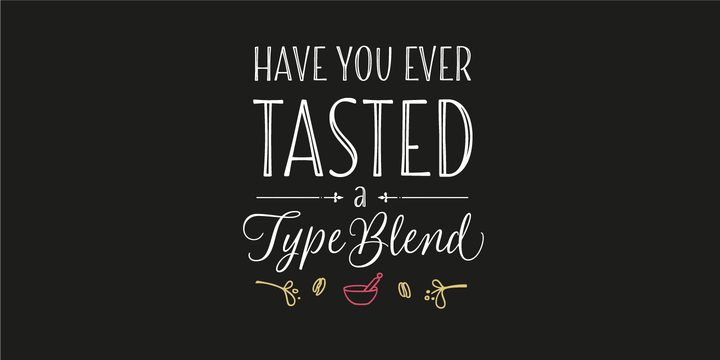 Blend is an handmade typeface created by Sabrina Mariela Lopez and published by Typesenses which was inspired by the myriad flavours of coffee. A mixture of 21 styles (can be used separately or all together). It includes a lot of OpenType features, Decorative Ornaments, frames, playful Dingbats, handmade Roman Capitals etc. You take two or more types of coffee beans and put them together and you make a coffee blend. It can create a new look and use’it for logo, magazine, menus, invitation, wedding etc. on Gallery is a user guide and also can use applications that support Open Type … a must have! A font description published on Wednesday, September 23rd, 2015 in Fonts, Sabrina Mariela Lopez, Typesenses by Alexandra that has 8,687 views.